The Modernization Team is coming to campuses this April to share the latest project information and to hear questions and feedback. Please visit your nearest campus. Meetings are open to all, and no RSVP is required. If you’re unable to attend in person, please email modern.initiative@wsu.edu for a link to participate. More information is in each calendar event linked below. *The Modernization Initiative team will coordinate with the College of Agricultural, Human, and Natural Resource Sciences (CAHNRS) to schedule visits to each Research & Extension Center. This announcement originally ran in the WSU Insider on April 18, 2019. Participants listen to Nigel present at one of 56 Discovery Workshops. 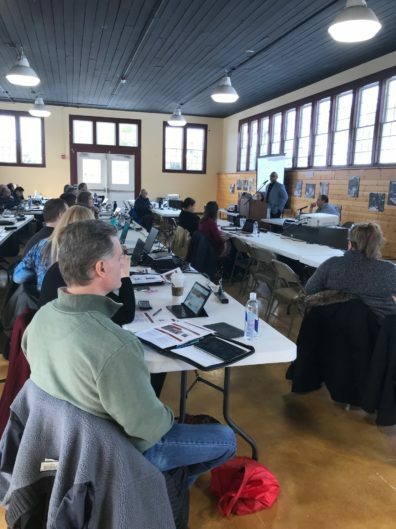 More than 365 people dedicated their energy and expertise to advancing the Modernization Initiative through a series of Discovery Workshops this February through early April. These Subject Matter Experts (SMEs for short) from all areas of the university explored and discussed current business processes, procedures, and policies. They helped the Modernization Team document mandatory and regulatory requirements, business needs, and goals for future processes. The 56 sessions were the first step in learning about our business processes today and envisioning how they might work in the future. 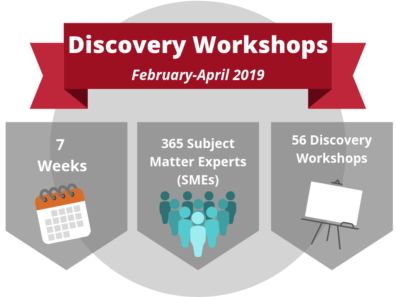 The Modernization Team will use the information captured during these workshops to help guide conversations in focused Design Sessions this April and May, where participants will further delve into how Workday might handle WSU’s business needs. The information captured is critical as we move closer to configuring the first prototype of Workday for WSU. Thank you to all the Subject Matter Experts for their invaluable contributions to the Modernization Initiative! 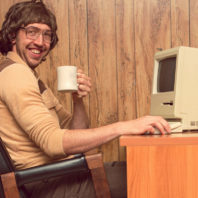 WSU’s human resources, payroll, and financial systems were considered modern mainframe applications when developed in the 1980s, over 35 years ago. These legacy processes and systems are paperwork-heavy, time-consuming, and increasingly risk-prone. In the early 1980s, the groundbreaking Commodore-64 home computer with its 64 kilobytes of memory was released and “ET: The Extraterrestrial” was becoming one of the brightest stars in film history. That same period, Washington State University launched its new technology system for human resources, payroll and finances. Now, nearly 40 years later, WSU has grown from a single campus in Pullman to five campuses statewide. And if E.T. came back to earth, he could phone home with a 256-megabyte smart phone. Earlier this month in a letter to the WSU community, President Kirk Schulz provided an update on the Modernization Initiative project including timeline, cost, and what the WSU community should expect moving forward. Read the full letter from President Schulz here. As we continue to improve the University’s fiscal standing, we simultaneously must address the critical need to upgrade our antiquated financial and human resources system software—which creates its own fiscal challenges. As you may know, at their May meeting our Regents discussed a financing plan to purchase a new software package for all of our campuses called Workday. Workday is a comprehensive Enterprise Management System used by many of our peer and peer-plus institutions. It is well suited to the unique needs we have at a public research university with multiple campuses and geographic locations. Earlier this month, WSU completed a competitive RFP process for a strategic integration partner to help implement Workday across the university. We are pleased to announce that Deloitte has been selected as the apparent successful integration firm. The selection was reached through the evaluation of written proposals performed by the 13-member evaluation team, feedback from on-site interviews with the firms, reference checking with other institutions, and consultation with the Modernization Initiative Steering Committee. After a competitive and thorough procurement process, WSU named Workday as the apparent successful software vendor. WSU will be joining a large number of universities who use or are implementing Workday to support their core finance, payroll and human services activities, including: Cornell University, Arizona State University, Louisiana State University, Brown, Carnegie Mellon University, Nevada State Higher Education System, Penn State, University of Virginia, The Texas A&M University System, University of Miami, University of Rochester, University of Southern California, University of Texas at Austin, University of Washington, and Yale. *The Modernization Initiative team will coordinate with CAHNRS to schedule visits to each Research & Extension Center. Video conferencing will be available. Check each event for details.